It have been easier, wouldn’t it, to have allowed trimmable winglets on AC72s? The prospect of flying two AC72 hulls clear of water resistanceand under controlhas been keeping the engineers up late. The recently-released Interpretation Number 21 of the AC72 rule by the Measurement Committee is a response to some innovative noodling on how the job might be accomplished, given the rule’s prohibition of trimmable winglets. Per standard procedure, the published ruling does not identify the team requesting clarification on a set of questions. And it doesn’t necessarily mean these are good ideas. 1. 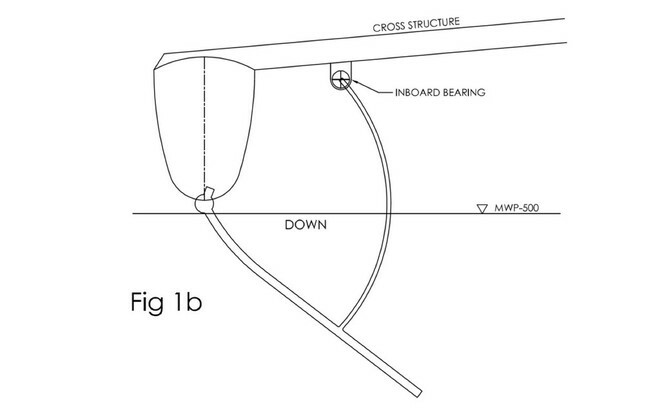 Is there anything in the class rule that prevents a daggerboard being supported in a bearing attached to the cross structure? 2. 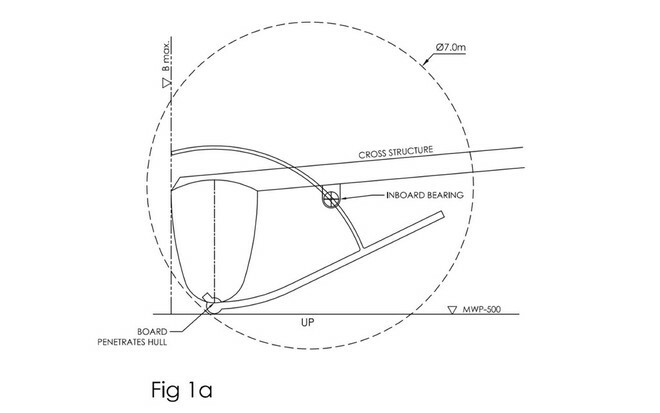 In Figure 1a & 1b is the point where the daggerboard penetrates the hull bottom shell, the lowest load transferring bearing referred to in rule 9.4? 3. 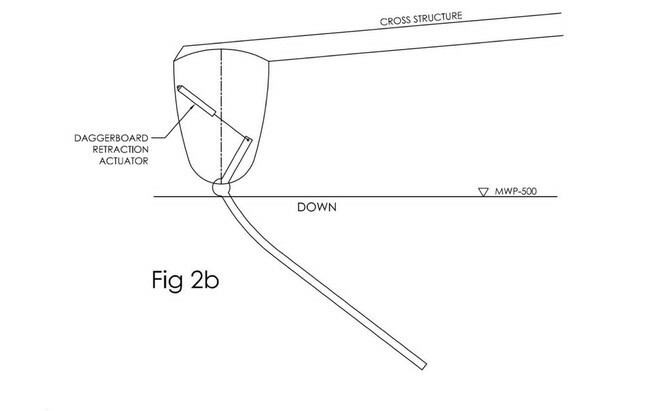 In Figure 1a & 1b is the daggerboard shown, which is a single rigid component, considered to be one daggerboard? 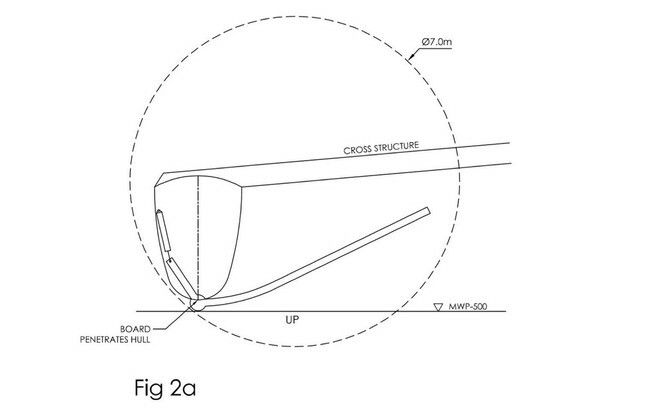 That is a ‘y’ shaped single rigid component. That penetrates the hull at a lower bearing. That retracts by rotating at the lower bearing in the hull, and sliding through an upper bearing on the cross structure. That, at times, is supported in two places: at a lower bearing on the hull, and an upper bearing on the cross structure. Whose rake and yaw could be adjusted by means of a rotation of the lower hull bearing, and a rotation and/or translation of the upper cross structure bearing. Whose rake and yaw could be adjusted by means of a rotation of the lower hull bearing. The answer, as signed by Measurement Committee Chairman Nick Nicholson, is, nope. Nothing in the rule to prevent it. If you think it’s a good idea, and you can pull it off, have at. 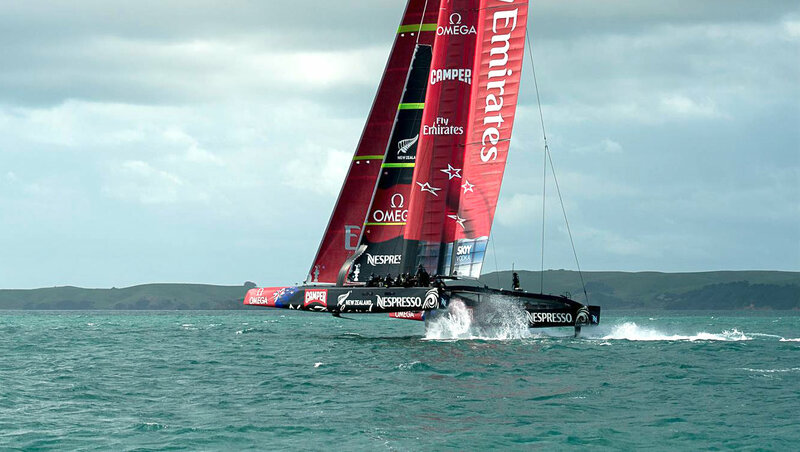 9.9 Daggerboards shall not be designed or used to generate force for the purpose or effect of increasing righting moment when used on the windward side of an AC72 Yacht. The difference . . . According to the latest plan, l’Hydroptere will hang around San Francisco Bay until the October 4-7 ACWS is complete, then sail back to Southern California, go to the hard, and look toward a Los Angeles-Honolulu record attempt in 2013. The next time, they can be ready when the isobars say GO. 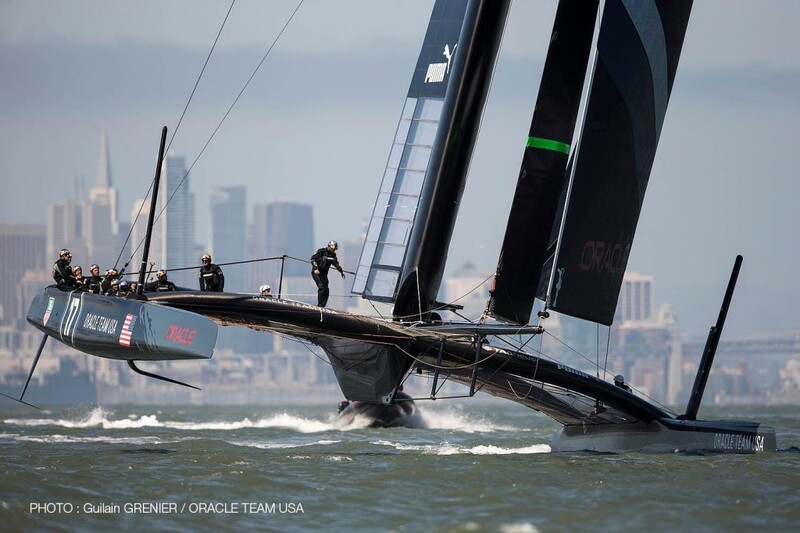 And BTW: Oracle Team USA was back on the water on Monday. No, it’s not a trimaran, but that center “hull” that isn’t a hull contributes a lot to rigidity, plus the flexibility to move the wing forward or aft, if needed. Could it possibly help the boat through a maneuver?